Bought these on a lark in Sandpoint, Idaho, for 25$ Best gear deal I've seen in many years. These have been essential in rainy foraging hikes in the PNW. Trusted friend considering I'm usually in day hiker shoes and in the rain. 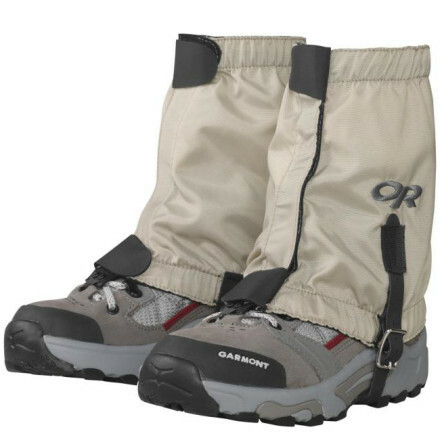 Completely durable and functional, these gaiters are a good investment if you're in the market for a pair. 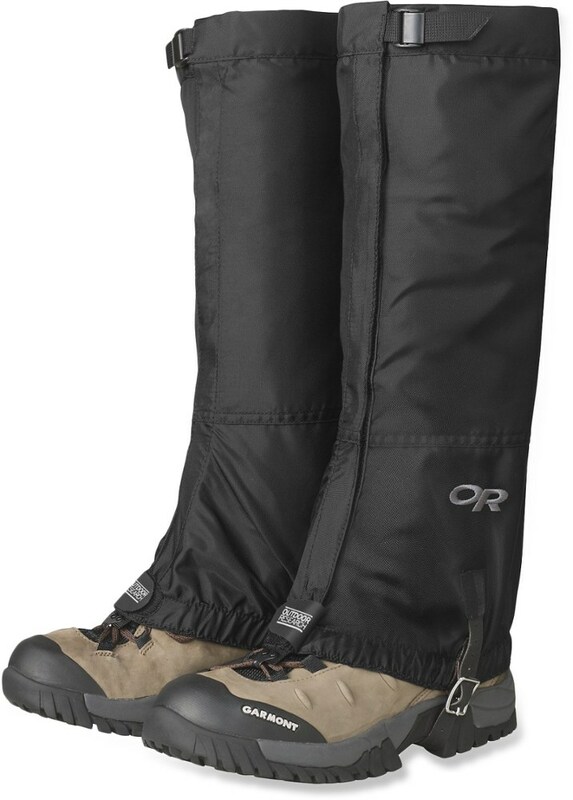 I've had these gaiters for about three years now and have started using them a lot more in the last year since making a move to Alaska. Most of their use comes during hunting season, but they're out on a lot of backpacking trips and an occasional winter foray; they're also handy if you find yourself doing a lot of shoveling after a couple feet of snow. Paired usually with leather boots, they do a great job of keeping things dry and keeping me from snagging and ripping pant legs and rain pants during the all too frequent bushwhacking required to get just about anywhere around here. I would recommend trying them on before buying because I definitely had to get a larger size than I thought necessary in order to get a decent fit, but the fit is very good and the material is burly, including the strap and velcro. Based on my experience so far, I expect these to last for a long, long time. I wanted to get a pair of these for Mt. Rainer and also technical ice-climbing IV/V+, inspired by Jeff Lowe's seminal Ice World book. Fortunately I was able to try them out in my local REI store before buying. They simply did not fit me. I have large muscular legs with very large calves and the gaiters simply did not reach around my calf muscles (I also tried the regular Crocs, same problem probably even narrower). Otherwise, the design, construction and quality appeared to be good, esp. the tough construction/reinforcing in the all important inner crampon kick zones. The replaceable strap underneath is particularly well designed and implemented. I find gaiters hellish fiddly to deal with. For me, zips are just too fussy and unreliable for serious conditions. Velcro is better, provide the fit is adequate but snow can clog it up. In the end I made do without gaiters (on Mt. Rainier, Adams, Ben Nevis, Cairgorms, Starved Rock Illinois and French Alpine waterfall ice at La Grave La Meije, Grand Teton) and managed just fine without them. Although my boots were quite high and waterproof (Koflach Ultra plastic shell boots and La Sportiva K2 leather boots), and usually I wore stretchy Troll or REI climbing pants with the cuff zipped over the top of the boots and waterproof leggings on top. 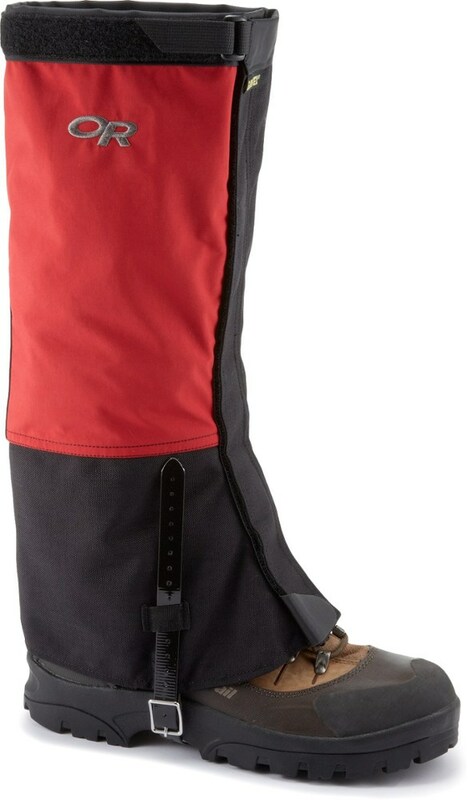 Several friends that do a lot of mountain walking and low grade scrambles in North Wales, Scotland — which can be very wet — (and Matterhorn and the Picos in Spain) use and swear by the famous *Berghaus Yeti Gaiters*, which fit tightly around the rand and edge on your boots and under the instep. They glued/sealed them to the boots sole to keep water out. They are also repairable (e.g. from Foot First Ltd. in Chesterfield, England). 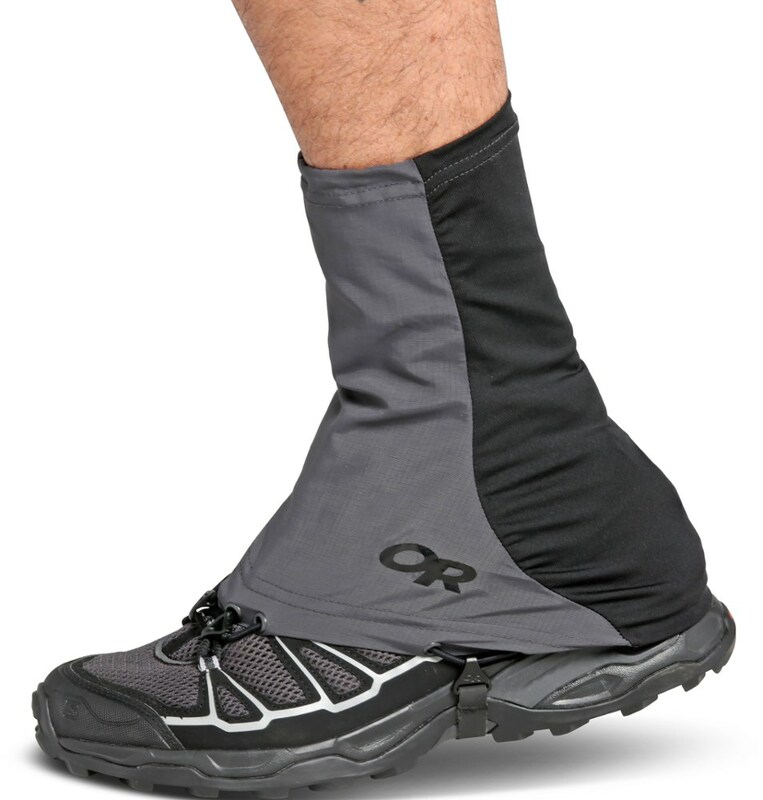 So, if your calves aren't too big, and you really feel that you need gaiters (see above, I haven't found a real need ... yet), and if you don't need the total coverage/protection of Yeti gaitors, these may well be the gaitors for you. Especially if you plan to wear crampons and/or want a close fitting gaiter (for technical ice perhaps). 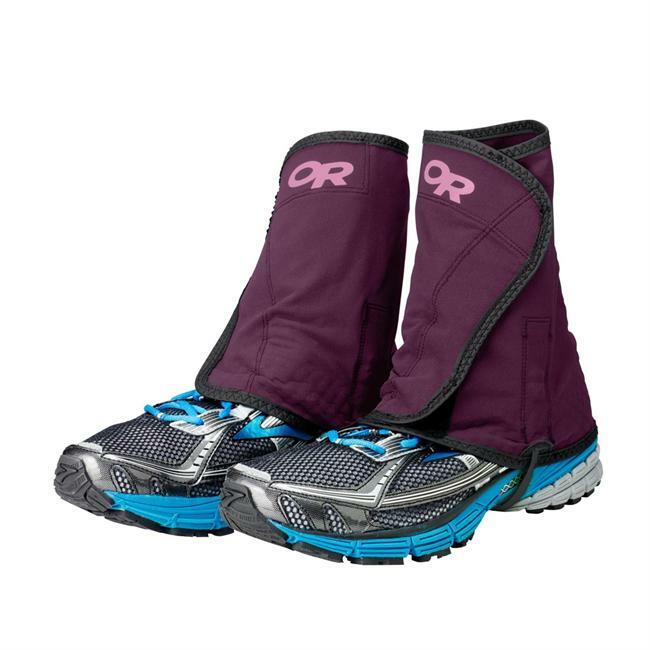 They are light and sturdy; this is the first impression without the crampons. 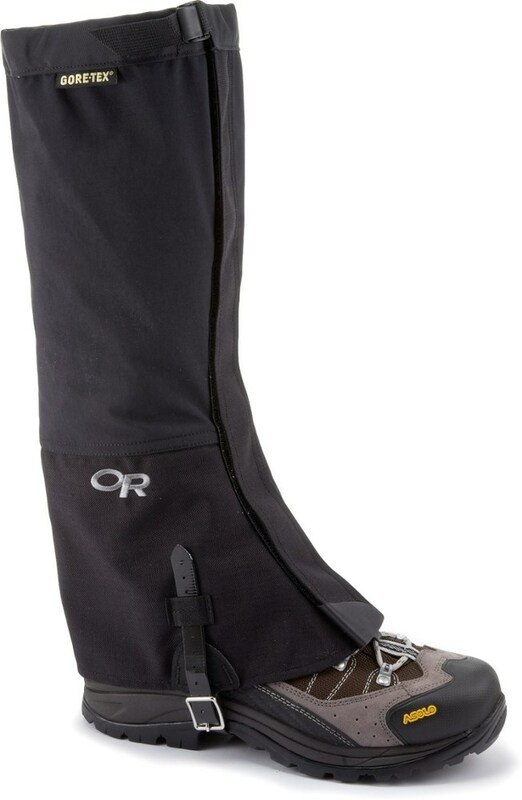 As long as the user is cautious while using the crampons, there is no other real danger one can damage these gaiters. The only drawback that I noticed is the plastic velcro strap turnaround buckle. It should have been much better off if they were metal. Mine is intact but if you pull the velcro strap to hard, that plastic piece might snap and you are doomed, so be careful with that. 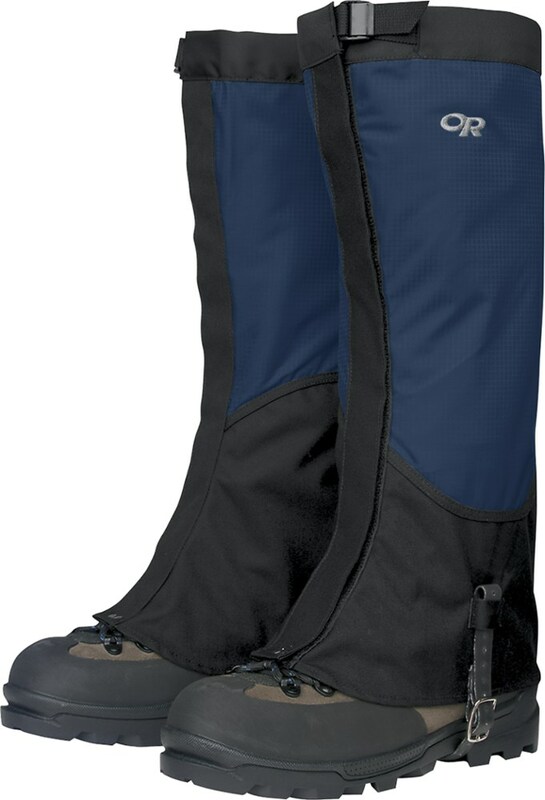 Best gaiter on the market for mountaineering. The field replaceable instep strap is awesome, and the fact that the entire inner leg is reinforced makes these guys able to take a beating. They are sized for a mountaineering boot, ie insulated leather or plastic, so try them on with the boots you're going to use before buying. I had to send mine back in because I bought a size too big.